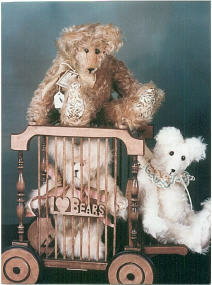 Collectible Teddy Bears Welcome to Wilde and Woolly Teddy Bears!! Welcome t o Wilde & Woolly Bears! 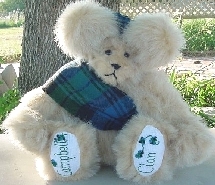 Campbell Celtic Clan Bear is a 10 1/2" plush bear, fully jointed, with hand embroidered paws of the Celtic Clan name (Also available in Dundas, Hamilton, Carmichael,McLennan, MacAlister, MacDonald, MacPhail, MacNab, MacNaughton, MacLeod, MacNeill, Watkins, Kennedy, MacFarlane and others...Scottish clan fabric for other clans not already in stock can be ordered, but will take longer) while he wears the sash and bonnet of his clan tartan. Available in many different clans! 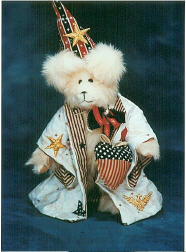 Confetti Personalized Bear is a 10 1/2" plush bear, fully jointed, with personalized hand-embroidered paws. For a really unique bear, her fur is a special order, the fabric dyed at the factory. 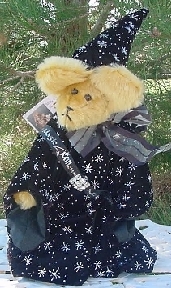 Balthazar, the Sorcerer , is a golden mohair bear wearing a black velvet lined cloak and hat, embellished with silver metallic stars, while he wears a medallion and has a sorcerer's chest filled with spells and ingrediants for potions. 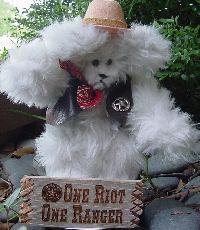 He is 10 ½" tall and is $45.00. To order a Wilde & Woolly Bear, contact Terry Wilde Spear at 2668 Galaxy Rd, Crawford, Texas 76638, or email: terryspear@ymail.com. (Checks or money orders are accepted for payment...layaways are also available, and I now take paypal payments.) Special orders will be finished within a week in most cases, except for Celtic Clan Bears if the clan fabric for the sash and bonnet needs to be shipped from Scotland first. Many Clan names are already available, however. Email or call for current availability. Wilde & Woolly Bears Commissioned for Author's Books: Special bears commissioned for author's books! Fun-loving Society Bears Wearing Red Hats! : Personalized bears wear purple knit sweaters, red hats deocorated with purple feathers and red boas! MacLeod, MacGregor and Kennedy Clan Bears:Gathering of the MacLeod Clan, a Larger MacGregor Clan Bear and Kennedy Clan Bears! More Celtic Clan Bears!! :Celtic Clan Bears!